Allyson of The Sweatshop of Love is hosting an all-inclusive knitalong of her patterns. That's stuff from magazines, her website, Holla Knits, other collections, etc. I know I said I got in over my head with knitalongs this summer, but I couldn't resist this. Besides, I've had yarn for Liaison for months and just needed a nudge to get it knitted. It is hard to focus on a summer knit, in Cotlin, when we're so close to our tiny, little window of cold here, but I just remind myself that Liaison is a top I can wear year-round and won't force me to purge a sweater box. What I'd like to be knitting right now is her Bristlecone pattern, but I'm truly, truly trying to work through my stash. I have multiple carrots set before me if I accomplish that goal. Things like: I'll let myself dye some yarn, I'll finally design something or other, or I'll let my birthday gift be an Oshima sweater's worth of lovely hand dyed yarn. (Have you seen Tanis' version of this?) I might even start the lowest of low tech knitting podcasts- a sketchy, note to self, kind of response to all of the podcasts I consume as I knit on fiddly patterns like Aidez and color work, even if no one ever heard my response. Don't worry, I have zero illusions about this. It would be for my own enjoyment. Plus, my husband seems to think it would be hilarious and keeps mentioning it. So, Liaison. I am doing a swatch for this one. It's called the bottom third of the sweater. Hey, that's just part of the laid back vibe I'm approaching things with since my foray into lots of lace weight. This thing is going to knit up fast. I got through the ribbing and one pattern repeat, working sporadically yesterday. It's a good choice for reading and tv because there's only the lace section to worry about each round. Why don't you join us? This knit along doesn't end until November 30th, which is plenty of time to knit most any of her patterns, especially a summer tee like mine. Come see fionaeharvey's take on Bristlecone. It's killing me. I would subscribe to your podcast even before hearing your first episode! 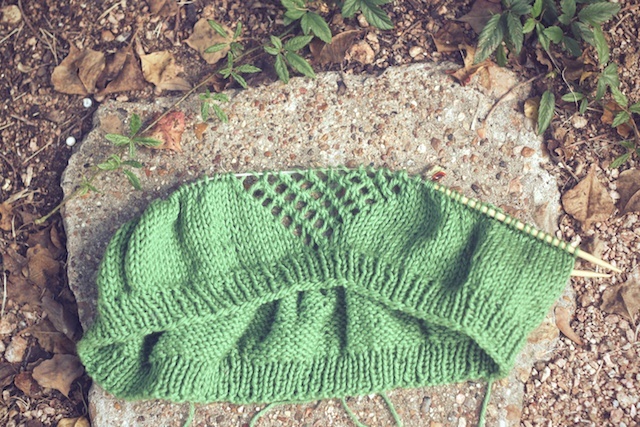 Love how your Liaison is coming along and Fiona's Bristlecone is amazing. As I would to yours if you ever do such a thing,Evelyn! I don't know if that'll even happen, though. I need to just get back to being regular here, first. Isn't that Bristlecone awesome? I'm loving all of the checks, houndstooth, and windowpane knits I'm seeing out there! Thank you, Kristen! I've toyed with the idea for a while, but I so enjoy watching them, I may never find the time or motivation to do it. Kind of like designing. It would be so much fun, but there's all these fun patterns right here, ready to go, so I never get around to it. I guess this pullover is one step closer to designing, right? I'm charting the little totoros myself. Btw, your EZ seamless sweater from last year's SSKAL was totally the thing that inspired me to try an EZ pattern. Re-reading Knitting Wothout Tears finally gave me the push. I'm currently knitting for the winter. It's difficult to set my mind on summery garments with the cold and rain we are having right now. And for once I stopped thinking about making sundresses. I would really love if you started a podcast, and would be listening to anything you would like to tell. Is it a curious experience to put a voice on a blogger friend, don't you think? Thanks for the support! I think it would be interesting to see my blog friends on video or audio, and it is when they have started podcasts. Sometimes the accents are not at all what you thought they'd be. For instance, I'm not as hick as it gets in Texas, but there is some southern drawl in me.